Stay on track with your fitness during the most wonderful time of the year! The holiday season is upon us, that means hectic schedules filled with holiday parties, big meals and travel. What can you do to maintain your fitness when time is limited? Remind yourself that exercise reduces stress–make it a priority. Here are few tips to help. My personal favorite is the Turkey Trot, I run in the morning and feel accomplished, and then enjoy a feast in the afternoon. It’s more of a Thanksgiving tradition for me than turkey. There are a million themed races, from pumpkin pie to Speedos, just choose one and have fun. I usually encourage my runners to embrace rest, but sometimes rest is a little too easy during the holidays. Instead, try a running a streak. Run or walk a minimum of one mile everyday from Thanksgiving through New Year’s Day. Once you start a streak, you won’t want to stop. Even if you feel like you don’t have a single free minute, you’ll find a way to squeeze in a quick run or walk to keep your streak alive. I’m not usually a morning runner, but the holidays are a little heavy with evening commitments. Let’s be honest, are you really going to skip that happy hour to run in the cold? No. That means the only time to run is early in the day. Make morning runs as painless as possible, don’t snooze and set out your gear the night before. Five minutes into the run, you’ll be glad you did! One of my favorite things about this time of year are the holiday lights. Every city has a neighborhood or two that’s known for their holiday decorations. Plan a special route, even if you’re traveling, that takes a tour of the best neighborhoods. Who knows, maybe a few friends or family will want to join you on the festive route. 5. Run with a purpose. Need to mail holiday cards? Want to grab a gift certificate at a local shop? Catching up with an old buddy over coffee? Don’t grab your car keys, lace up your running shoes and run to your destination instead. I use my hydration pack to carry all sorts of things besides water. 6. ‘Tis the season for treats! Candy canes, fudge and Christmas cookies are all the more reason to maintain your running routine. After a run, treat yourself! Try taking a hot bath (my favorite), watching a cheesy holiday movie, or even enjoy one of those sweets waiting for you at home. The key is, run first, treat second (& of course moderation!). 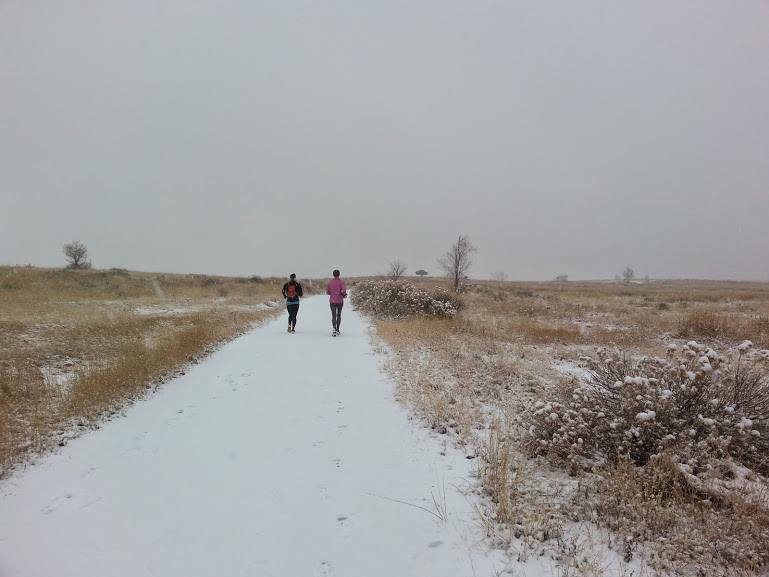 The snow is falling and spring seems far away, but in terms of marathon training, it’s just around the corner. If you’re signed-up for a spring marathon, training kicks off during the holidays. When you’re trying to decide whether or not you really “need” to do that run, ask yourself why you run. Thinking about Boston gives me the little extra nudge I need to get out the door. How do you stay motivated over the holidays?